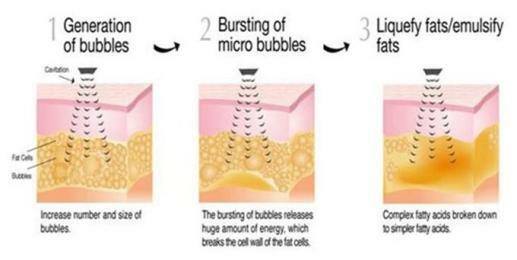 Beauty Clinic Lotus introduces a new treatment method that breaks down excess fat cells so that they can be disposed of naturally by the body. This treatment method is known as “Ultrasound”. Ultrasound works using sound and pressure waves which render the cell membrane permeable. The fatty tissue (triglyceride) which is released is converted into glycerol and fatty acids and after this it will be deposed of by the liver in the body’s usual way. Ultrasound therefore ensures that the body is able to break down and dispose of fat cells more easily. The target area(s) will be drawn onto the body and covered in a special gel which helps to conduct the ultrasonic waves. The hand-piece will be moved slowly along the target area’s surface while the treatment-head releases ultrasonic waves. You will feel your skin glowing pleasurably, but apart from that the treatment is painless. After this you will undergo a mechanical connective tissue massage (comparable to LPG, method endermology) which causes lymphatic draining to stimulate the disposing of cell moisture and other waste substances. This will firm up the skin. Before starting the treatment, you first will be weighed on scales with body-analysis. These will determine your weight, fat percentage, muscle mass, bone mass, water content, the body mass index (BMI) and the percentage of organ-fat. In addition (on request) we will take before-picture of the target areas. During the ultrasound treatment, you will relax in the treatment chair while the sound waves break down your fat cells. You don’t feel anything and will be able to do everything immediately after the treatment. For the best result the tissue should contain a lot of fluids, so therefore it is necessary you drink at least two litres of water a day during the treatment period. In addition it is important to keep your weight stable and therefore not to gain weight. In order to stimulate the disposal of the released fats, we recommend you do at least half an hour of exercise within 36 hours of the treatment and that you avoid eating carbohydrates as much as possible. This way the liver will best be able to break down the released fat for good. Attention: The ultrasound treatment is not a slimming method and it is therefore not suitable for people who are very overweight. In case of excess weight it is therefore advisable to first first do a slimming course. The ultrasound treatment is not aimed at reducing weight, but at modelling and firming the body thereby creating a harmonic silhouette. In order to maintained the results obtained by ultrasound you will need a more or less disciplined life-style with regards to nutrition, liquid intake and exercise. The darker coloured areas in the picture show an elevated level of fat cells in many people and are therefore eligible for Ultrasound treatment. In those areas of the body where there are many nerve pathways, superficial gland tissue and big veins cannot be treated. The under-arms, backs of the knees, genital area (male and female), hands, neck, face and chests can therefore not be treated using Ultrasound. In any case, there usually isn’t a a lot of excess fat in these areas. Ultrasound treatments have been scientifically proven! Depending on the target area and the amount of fat which has to be removed, the treatment will have to be repeated between 6 and 10 times weekly. You can clearly see results after 3 treatments. Treatment time is a maximum of 60 minutes. The released fat won’t be removed from the body directly (as happens in liposuction), but will be disposed of naturally by the body using the lymphatic system. This is the same system that clears up bruises. The Ultrasound process can only happen in a hydrated environment. Therefore, you should drink at least two litres of water a day. To optimise the treatment effect, it’s best to start this a week before the first treatment and to keep it up until a week after the final treatment. Results are only possible if the tissues contains a lot of fluids! Apart from that it is important that your weight stays stable and so you shouldn’t gain weight. When the fatty tissue has disappeared it won’t come back if your weight is stable. With unhealthy, unvaried nutrition, insufficient fluid intake and lack of exercise the body will create new fat cells. • Firming up of specific areas of the body. • If your body weight is stable, the results are permanent, so you don’t need to come back for “maintenance” sessions. The treatment is not recommended in case of obesity, diseases and disorders of the liver, pregnancy, diabetes, metal prostheses near the target area or disorders of the metabolism.